You'll be £14.99 closer to your next £10.00 credit when you purchase Eyewitness In the Crimea. What's this? George Frederick 'Fred' Dallas wrote 137 letters to his family and friends while on active service in the Crimea. A company commander in the 46th Foot, his first letters reflect a soldier's enthusiasm for the 'brilliant affair' that awaits the British Army overseas. Within weeks of arriving, excitement turns to disbelief at the continual misjudgement of his leaders. Poor preparation and divided command exposed the troops to surprise attacks from 'The Russe', and to the appalling conditions of the Crimean winter. By contrast, Dallas' reports on the casual bravery of his comrades recognise the true heroes of a mismanaged campaign. Through these letters we relive the terrible perils of combat and siege warfare: the author's almost miraculous escape from serious injury, whilst continually witnessing his comrades' slaughter; the monotony of being entrenched in Sebastopol; the 'utter confusion' surrounding instructions to attack; the mistakes at Inkermann and the Redan; the wearying cold. We also get an insight into the quieter moments in camp and the friendships forged between the men. 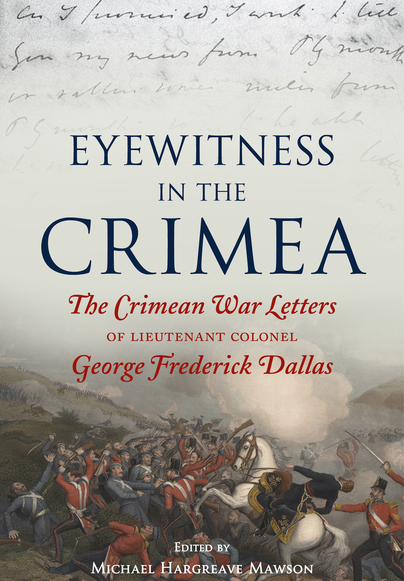 Supplemented by the editor's excellent footnotes and detailed biographical index, this is a revealing and intimate history of all those involved in the Crimean War. Lieutenant Colonel Frederick Dallas, sometime captain, 46th Foot and ADC to Sir Robert Garrett, wrote over 130 letters to his family and friends while on active service in the Crimea. In this work, first published in 2001 and now as a paperback in 2015, the reader can read of the perils of combat and monotony of siege warfare, the mistakes made at Inkerman and at the Redan, as well as the wearying cold. The detail in the writer’s words is often uncompromising, but there are also humorous and colourful anecdotes inspired by his comrades. The letters are supplemented by footnotes and narrative from the editor – who is the great, great grandson of Lieutenant Colonel Dallas. The book also features notes on the history of the family of Dallas, the letters themselves, which divided into three sections 1854, 1855 and 1856, plus and appendix on the known descendants of the writer, a glossary, chronology and bibliography, rounded off with an index of all those mentioned in the letters. There are three maps and numerous plates supporting the text. MICHAEL HARGREAVE MAWSON is the great-great grandson of Lieutenant Colonel Frederick Dallas and a respected historian of the Crimean War.